Michijune is parade held as a memorial service for one’s ancestors. The first day of Obon called “Unkeh”, observed in Okinawa on July 13 of the lunar calendar, means “welcome,” and the last day of Obon on lunar July 15th, is called “Uukui” that means good bye. 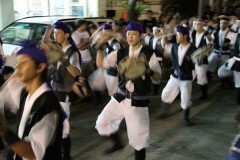 Traditionally, youth Eisa groups would parade through villages and towns on the last day of Obon. However, the parades are now held on any day of Obon. “Obon” is a time one’s ancestors come back from the other world to meet the living. During the three days they have to be entertained, otherwise they might get angry and cause havoc. Ancestors have a place to go back but the evil doesn’t, people think the evil might stay here until the last day of Obon. Michijune helps the evil to go back to the nether world. It is one reason for performing Eisa that is also a kind of exorcism.